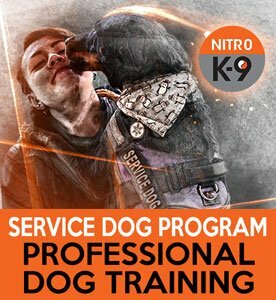 Nitro K-9 primarily serves those who need emotion support or psychiatric service. We can train other types of service dogs on a case-by-case basis. Please feel free to inquire. My journey training emotional support dogs really started in January 2010. A young woman contacted me for Level 1 training. Her dog excelled, and while he had some initial aggression issues, we completely eliminated the behavior. As we worked together, and gave the dog a real shot at the future with the training he needed, I realized just how much his handler needed him too. This woman had been through horrific ordeals, is a PTSD survivor and suffered from both acute GAD and panic disorder.. I have long taught search and rescue methods along with a wide variety of tracking and scent detection methods. I’ve worked with dogs to detect elevated or lowered insulin levels in diabetic patients. Our four-legged friends can detect seizures, earthquakes, strokes, and many, many other useful things for us. Why not ANXIETY? Why not train a dog to detect panic and anxiety and go to the owner and provide emotional support? We discussed whistles, clickers, snapping and even calling. I was not happy with ANY of these methods because during a panic attack the victim can seldom think clearly or muster the strength to call for help. I had the utmost respect for this young woman because she could ask for help and be so open about her condition. She was not always able to be calm, but she could become calm through the support of her dog, Bruno. It was a reverse concept for me and it awakened an even deeper understanding of animal behavior in me after almost 16 years training dogs. Through working with Danielle, I have developed a method that successfully teaches dogs how to detect this very common problem through sense of smell and hearing. You will not need a whistle or a clicker or anything other than the correct dog, trained for your specific needs. We are not going to BREAK your dog, as it is not needed in the way a service dog would be needed to assist a blind person. Instead, we feel that focusing on the bond between dog and handler to be the correct way to train the dog for this purpose and the best way to keep your dog happy and bonded to you. The Nitro K-9 emotional support program has been one of the most uplifting endeavors of my life. We will offer any assistance needed for the proper behavior and testing of your dog for this purpose. As a person who has struggled with anxiety and panic myself, it is so rewarding for me to help clients train their dog to be there when they need them. Emotional Support Dogs in Washington State require a letter a physician explaining that you need the dog to help enhance your quality of life caused by a disability (In Danielle’s case, PTSD). We DO NOT provide this letter, nor do we have the authority to do so; we are just the dog’s trainers. We can also help you train your Psychiatric Service Dog. Psychiatric Service Dogs differ from Emotional Support Dogs differ because they are trained to do specific tasks that alleviate disability-caused problems. Here’s more information on the difference between the two. That said, your dog can go to whatever level you choose to train to, provided that the animal has the proper drive. It must also be understood that not every dog is a good candidate for this type of training as a high retrieve drive and a strong scenting drive are needed to accomplish the scent association of panic and the response to RESPOND, for our training program in emotional support. We are here to help. We understand firsthand how frightening anxiety and panic are. With the support of your medical professional, we can help you select a dog for this purpose—or we can come and test the dog you have. And even if the dog you have has some shortcomings, we can usually work with you to figure out what is possible. We do NOT diagnose any of the above mentioned conditions, PTSD, GAD, or Panic Disorder, you must be diagnosed by a medical doctor or a Psychiatric Doctor to qualify for this program. When training for a Psychiatric Service Dog we require your doctor to write a letter and suggest which specific tasks the animal should learn to support YOUR condition. After we have accomplished this you may apply for certification through your local governing body. The ADA, however, defines a service dog as an animal being specifically trained to provide assistance to an individual with a disability. How does training a service dog with you work? Upon evaluation of your dog and the details of your relationship with your dog, we will create a custom training program to prepare your dog for a specific psychiatric task or emotional support. We generally work with our clients through our regular obedience training. Because we work one-on-one, we will create a specialized program just for you. In some cases, we can train the dog for you through our Hands Off program. The cost for training a service dog is the same as obedience training. It will depend on your dog’s size and the amount of time required. Most people find training to Level 2 sufficient, provided the dog is old enough and has had enough practice. Can you help me select a service dog? Yes. We charge a flat hourly rate to investigate breeders, analyze pedigrees, and recommend specific dogs for the type of work required. However, please note that sometimes the most promising candidates wash out of programs. We can’t make any predictions or guarantees. I got a dog from the shelter. Can he be a service dog? Good service dogs are rare. There’s a possibility your dog can do it, but most can’t. Can you sell me a fully trained service dog? No. Dogs currently being sold as “service dogs” usually have market values from between $10,000-$15,000. We are opposed to dogs being sold for a profit for this purpose, and feel that it is absurdly expensive and that good people are being taken advantage of. That’s why we also don’t charge extra to train service dogs. Can you train my dog to be a protection dog and a service dog? No, and we won’t consider it even for a second. We train service dogs through our Level 1 and Level 2 obedience, which we customize specifically for your needs. Click the sign up button below. Choose the Level 1 training program for your dog’s size and follow the prompts. This will give us that background we need; then we’ll contact you within 24-48 hours to discuss your issues. From there, we’ll set up an evaluation. Please note that there is no financial obligation until we meet in person for an evaluation. Also, we do NOT inflate pricing for training service dogs; you will not be forced to pay extra to train with us. We want to help you and your dog achieve your goals fairly and honestly. Please send me an email if you have further questions or just need to talk. *All information is SSL encrypted. Your personal and private information are secure and we promise to never disclose identities or behavioral issues unless faced with a court order.